Though Ghiradelli is known for selling all-natural baking chocolate (like semisweet and bittersweet chocolate chips), their track record on specialized chocolates is troubling. For me, it’s frustrating to find a brand that cares about natural ingredients in some of its products, but not others. The inconsistency makes them difficult to trust (though they are still my chocolate chip of choice for cookies). 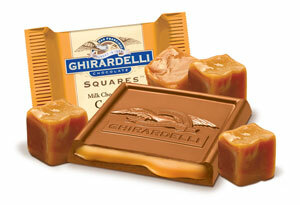 Recently, I was given some of Ghiradelli’s chocolate squares with caramel filling. They come in a nice little bag like Ghiradelli’s other special squares. And the photo makes the look damn good, right? No kidding. But let’s take a look at the ingredients. Darn. These are so close to being great. No vanillin (the fake vanilla), more cocoa butter than soy lecithin, and then … artificial flavor. It’s probably the caramel.